Keith Guyler’s notes say that the chapel was opened in 1871 and closed around 1978. On Google Street View in 2010 it is shown in use as a house. The date of the building of the Meadowtown PM chapel has become even more uncertain. The “Wellington Journal” of 30 May 1896, page 7, reported that the chapel had just celebrated its 22nd anniversary in Whit Sunday, which puts the chapel’s building date as 1874. Further research is required! The “Wellington Journal” of 6 September 1902, page 11, reported that the chapel had been renovated by Mr Robert Gornall of Minsterley, and the chapel re-opened on Sunday 31 August 1902. The same newspaper, of 12 November 1904, page 11, reported that they had just purchased a harmonium & the “opening ceremony took place on Sunday” i.e. 6 November. 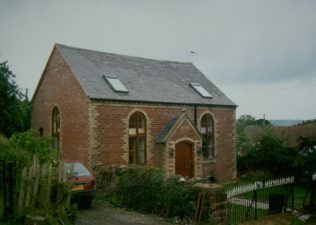 The chapel seems to have been built between 1851 and 1870. It does not appear in the 1851 Religious Census nor in S. Bagshaw, “History, gazetteer & directory of Shropshire”, 1851 [an excellent publication]. I came across a reference to the chapel in the “Primitive Methodist Leader” of Thursday 29 October 1925, p. 717, which said that it had “re-opened”, so must have closed temporarily, perhaps for some refurbishment? Thanks Janice: another piece of evidence for the jigsaw! It would seem that the chapel was already in existence by June 1870 as in the local newspaper “Eddowes’s Journal” for Wednesday 29 June 1870, page 5, there is a notice of a collection having been made in Meadowtown Primitive Methodist Chapel.